Do you need a stylish, flexible and highly portable display? Why not Consider one of our great v alue Phone2display. · Why am I attending the exhibition? What do you want to get out of the exhibition? Do you want to create brand awareness? Are you introducing a new product into the marketplace or do you simply want to increase general sales? Set yourself and your team clear goals and objectives so at the end of the event you can evaluate what has been achieved. · What will the stand look like? If you decided on a boothkey stand it is vital that any images and logos you use are of good enough quality. The display represents you and your company so spend time and if needed money on choosing the right high quality imagery. Getty Images is always a good place to start. Remember you will be surrounded by your competitors so you want to stand out for the right reasons. If you have chosen a fabric pop-up stand then consider what fabric colour will compliment your posters and company colours. · What is your budget? There is a package available to suit almost any budget, with prices starting from as little as #400.00. Why not contact our sales team who will be able to offer advice and run through the options available. · Can I use my portable display as a permanent display after my show? Once the event is over a boothkey should ideally be used as a permanent display in a showroom or reception.The dye sublimation skill will prevent graphics from fading in the short to medium term providing you with an ideal 'silent salesman. · Who will be using the system? Will it be solely you who transports and erects the stand or will your sales force be taking it out on the road? 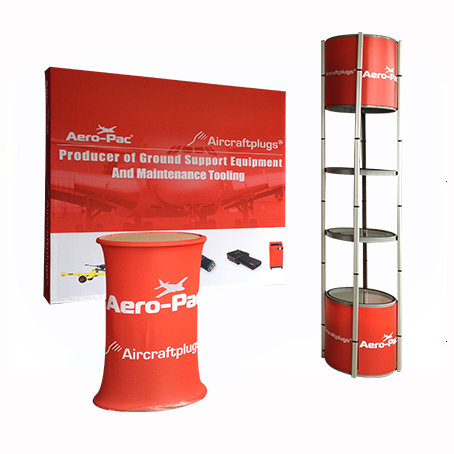 · Do you need help with the design of your stand? Unless you have an in-house design team or know of a reputable design agency, preparing artwork can be a rather daunting task. At Phone2display we offer a comprehensive design service, working with you to create a professional and eye catching display. All you need to do is supply us with a basic brief along with any logos, images and text, and leave the rest to us. We want you to feel confident and comfortable handling the display, so our system incorporates a sleek aluminium concertina frame and lightweight system.Depending on which package you choose you will either have a set of graphic panels or Velcro friendly fabric panels. These are ready to hang and effortlessly hook onto the top of the frame providing you with an impressive, flawless back wall. Phone2display has been supplying premium displays for over eight years and to make life easier we have developed set packages, many of which include lighting, wheeled transit cases and a case to counter conversion kit, transforming your hard drum into a professional looking counter. 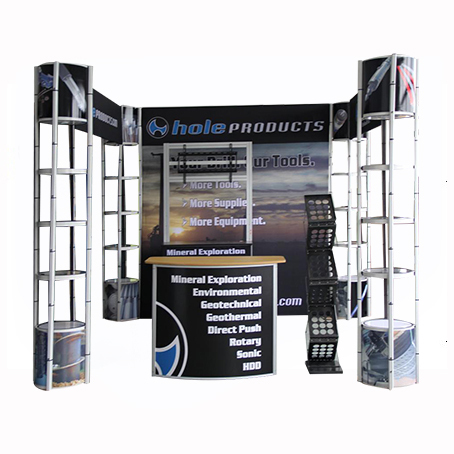 To complement the range we also provide collapsible literature stands, sign holders and pop-up banners. If you do not find what you are looking for in our standard pop up stand range, please contact us on +86 519 88127708 to know more and help for info. We are so confident in our product that we offer a life time warranty which covers the frame and bar components against manufacturer's defects. © 2019 Changzhou Phoneto A & D Equipment Co., Ltd. All Rights Reserved.